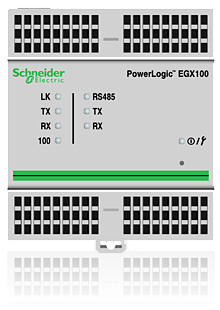 The Schneider EGX100 is an intelligent Ethernet gateway that provides fast, reliable Ethernet-to-serial line connectivity between intelligent meters, sensors, and other remote instruments. Power monitoring software is recommended as a user interface because it provides access to information from any device. It also provides advanced power quality analysis and energy management reports. The PowerLogic EGX 100 provides one Ethernet 10/100 base T port and one RS485 port and serves as an Ethernet gateway for any device or system supporting Modbus protocol over a daisy-chained RS485 connection. It offers complete access to device status and measurement information via PowerLogic Energy Mangement Software. DIN-rail mount. Features unique to the EGX100 include ‘TCP/IP Filtering’ security that lets you specify the level of access each Master device shall have to connected serial devices. ‘Serial master support’ that lets a serial Modbus master device connected to the gateway’s serial port access devices across a TCP/IP network.